People often ask how Nirarta was started. I took the first step to create Nirarta in January 1995, when I stood on the present site – then a grove of clove trees – and realized that this place, with its upland stream, surrounded by green hills, between sea and mountain, was exactly what I had been seeking. This was my moment of choice. I could stick with familiar work and territory in Europe. Or I could risk buying land in a far-off place, and create a centre for people to connect with the core of their life. I knew at once that, to be true to myself, I had no choice. I plunged in and began a project that is still unfolding. The informal opening of Nirarta in January 1999 was thus the realization of a personal dream. I feel it is something I have been intimately involved in creating as a personal expression of who I am and something I have received, like a gift or ‘task’ from the spirit of life itself. I am of mixed Italian, Polish, and English descent. I grew up in East Anglia, England, where I was educated by the Christian Brothers, who stimulated my asking questions about life. I read Modern Languages (French and Italian) at Liverpool University, where I began a life-long interest in meditation and higher states of consciousness. My MA dissertation at the University of East Anglia in Comparative Literature focused on the use of mirror imagery to reflect states of awareness in poetry. After three years in an ‘ashram’ in the Magic Mountains of Switzerland, I earned a PhD for research into the role of experiences of heightened consciousness in literary creativity. Originally trained by Maharishi Mahesh Yogi, I have been a meditation teacher since the early 70s. A former member of Tony Buzan's Learning Methods Group, I have always been deeply interested in the learning process. I have also trained in Person Centred Expressive Therapy in California with Natalie Rogers, and spontaneous movement with Gabrielle Roth and others. I am a certified Trainer in Neuro-Linguistic Programming (NLP), having worked in this field since the early 80s. I have been active teaching it at an advanced level internationally. Many influences (including Balinese philosophy and practice) have come together in my more recent work with Jan Ardui to develop the philosophy and approach underpinning Nirarta, ‘The Way of Unfolding’. I spend most of my year at Nirarta among the flowers and butterflies with my wife, Dayu, and two girls Maya and Mira, hanging out, as it is easy to do in Bali, with family, friends, staff, and guests, writing, researching, and teaching. For about three months a year, I travel and give seminars internationally. the source and ground of all our experience. our true nature, the Self itself, reflector of all that is. At Nirarta, we treat Self-knowledge, not as some distant and ever receding goal, but our immediate birthright, here and now. Together, we explore ways of coming home directly to this creative source, so that we can enjoy peace and freedom within, while acting with clarity, delight, and dynamism. This is Living Awareness – Awareness that is both alive and lived, here and now. Sensitivity to pattern and growing alignment with the deeper pattern of our lives help our personal unfolding to resonate with the process or 'Way of Unfolding' in life as a whole. When this happens, we enjoy and support fullness in life, both in ourselves and in others. We flow with the stream of life, and are able to accomplish much with minimum striving. Life supports us as we support life. Alignment – how we are approaching our performance. grow and develop as a whole person. Awareness is the source and ground of all our thinking, feeling, and perceiving. It is the basis of our learning and knowing, and hence the key to effectiveness in action. The purpose of meditation is to allow mental activity to settle into that simple and subtle Awareness which reflects all our experience. At first this Awareness is glimpsed fleetingly, revealing itself eventually as our true nature and Source of all that is. Awareness Meditation involves gentle, innocent settling into our own being, without effort or attempts to stop thinking and ‘concentrate’. Peter is a meditation guide with close to 40 years of experience practising and teaching meditation. In Re•Patterning we explore the patterns of thought, feeling, and behaviour recurring in our lives, until core patterns and assumptions about ourselves or our world emerge. This process helps identify where our deep beliefs about self and world are interfering with our general well-being and ability to function harmoniously and successfully in daily life. Through Re•Patterning, we can revise these unhelpful patterns and assumptions, so as to bring them into harmony with our inner being. This supports the natural process of unfolding in our lives. For more on this topic, see the page Re•Patterning. In Seminars at Nirarta, small groups come together to support change, learning, and growth, in themselves and each other. Generally, a short presentation by the facilitator is followed by an activity for pairs, trios, or the individual to seed experience. Shared reflection in pairs, trios, and in the group as a whole helps deepen and integrate the change, learning, and growth that emerges. While there is a conceptual component to our seminars, the emphasis is primarily on lived and shared experience, so that learning is embodied in the person as a whole. Since earliest times, people have taken time alone in silent vigils and retreats to places of power, beauty, and silence, often in remote caves, shrines, and hermitages in mountain, forest, and desert. Retreats, in short, are an ideal way to unleash the power of deep transformation, accelerate inner awakening, and ease our path of unfolding. 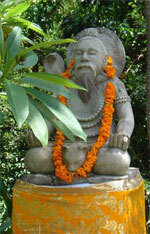 Nirarta is named after Danghyang Nirarta, a great 16th century sage, who did much to shape Balinese Hinduism. Teaching and founding temples on his many wanderings, he blended Shaivist tradition with the Buddhist heritage received from his father, earning the title of ‘Dwijendra’ or ‘Two Paths’. His name ‘Nirarta’ means literally ‘Wealth in that which is not’. His name points to the knowledge that springs from the simplicity of Unknowing, the abundance abiding in the silent source life itself. The Nirarta Centre, too, brings two paths together. It aims to provide a bridge between the knowledge and insights of the West and the deep wisdom woven into the colourful fabric of Bali.